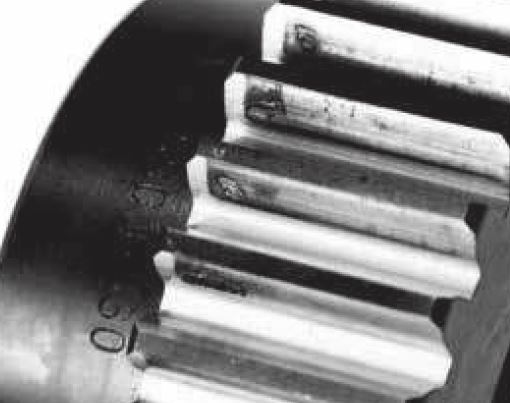 To meet your requirements, KHK stock gears are made in a variety of types, materials, configurations, modules and numbers of teeth. We also offer products that allow secondary operations to be performed on the bores, shafts, outside diameters, keyways and set screws. The following table lists the main features. Features : High strength, abrasion-resistant and compact. Features : Ground shaft pinions that allow modification of shafts to fit your bearings. Features : Although heat treatment is applied to tooth area, secondary operation can be added. Finished products for J Series are also available. 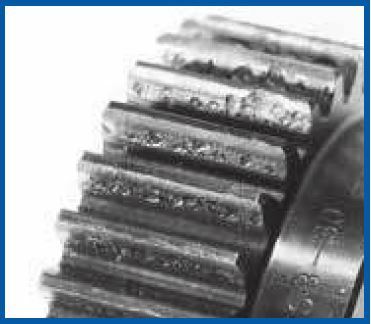 Features : For the SS series, Shaft-Pinions with a small number of teeth (10 to 13 teeth) are available. Features : A low priced, general usage gear with a large selection of modules and number of teeth, finished products for J Series are also available. Features : Hubless gears for lighter and more compact applications. Finished products for J Series are also available. Features : Narrower face gears for light-duty applications. Features : Hubless and narrow faces for even lighter and more compact gears. Features : Compact sized gears can be clamped to the shafts without a hub. Features : Low cost due to elimination of machining and reduction in wasted material. Features : Stainless steel gears for more rust-resistant gears. Finished products for J Series are also available. 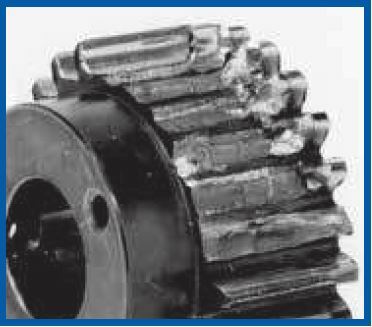 Features : Fine-pitch gears with rust resistance, enabled to clamp to shafts without any keys or set screws. Features : Fine-pitch gears can be used without lubrication, easily clamped to shafts without any keys or set screws. Features : Nylon teeth with steel hubs that can have keyways and set screws added. Finished products for J Series are also available. Features : Nylon teeth with stainless steel hubs for rust-resistance. Finished products for J Series are also available. Features : Possible to operate without lubrication. 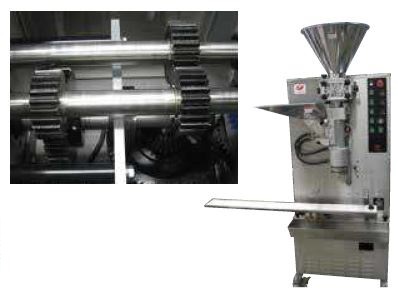 Suitable for food processing machines. Finished products for J Series are also available. Features : Low cost, mass-produced products suitable for light duty office machines. Features : Small module brass spur gears suitable for mating with DS gears. Features : Allows large gear ratios. Can also be used as segment gears and corner racks. NOTE 1 / Products with module less than 0.8 are thermal refined, without gear teeth hardened. NOTE 2 / SA-shaped products with module less than 1 have no material thermal refinement treatment. NOTE 3 / For products which are smaller than module 0.8, the accuracy grade is equivalent to the value shown. By chamfering the corners of the top land, gear noise is reduced, and the chances of damage due to handling and transportation are decreased. All KHK gears larger than m1.5 have their teeth chamfered. Black colored products are KHK stock gears that have black oxide coating for rust resistance; this ‘blackness’ is a product characteristic of KHK stock gears. Please select the most suitable products by carefully considering the characteristics of items and contents of the product tables. It is also important to read all applicable “CAUTION” notes before the final selection. Use of catalog numbers when ordering will simplify and expedite the processing of your order. Basically, all spur gears, internal gears and racks can be paired as long as the module matches. Products with different materials, tooth widths, or methods of cutting the teeth can be mated. The gear strength values shown in the product pages were computed by assuming a certain application environment. Therefore, they should be used as reference only. We recommend that each user computes his own values by applying the actual usage conditions. Also, SUSL Fairloc hub spur gears, DSL Fairloc hub spur gears and SSAY/K spur gears with built-in clamps need additional considerations of the starting torque. The table below contains the assumptions established for various products in order to compute gear strengths. JGMA (Japanese Manufacturers’ Association), “MC Nylon Technical Data” of Nippon Polypenco Limited and “Duracon Gear” of Polyplastic Co. The units for rotational speed (rpm) and the load (kgf/mm2) were matched to the units needed in the equation. 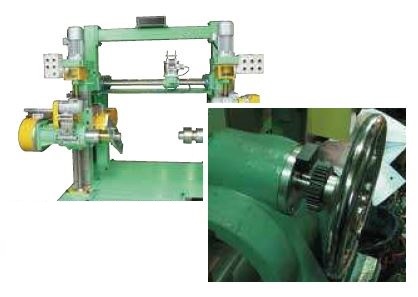 The allowable bending stress at the root 􀄱Flim is calculated from JGMA401-01, and set to 2/3 of the value in the consideration of the use of planetary, idler, or other gear systems, loaded in both directions. For SSG Ground Spur Gears, with module 0.8 or lesser, thermal refining is applied. Allowable bending stress and allowable hertz stress are referred to as the value shown in the parentheses. 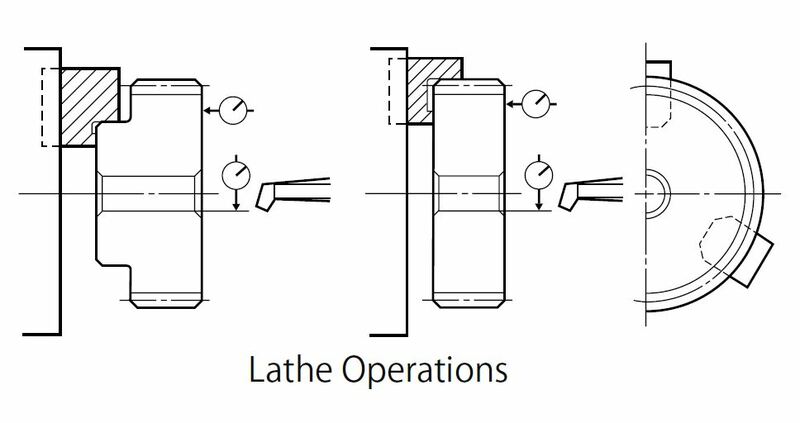 For SSS Spur Pinion Shafts, with module over 1.5, tooth induction hardening is not applied. 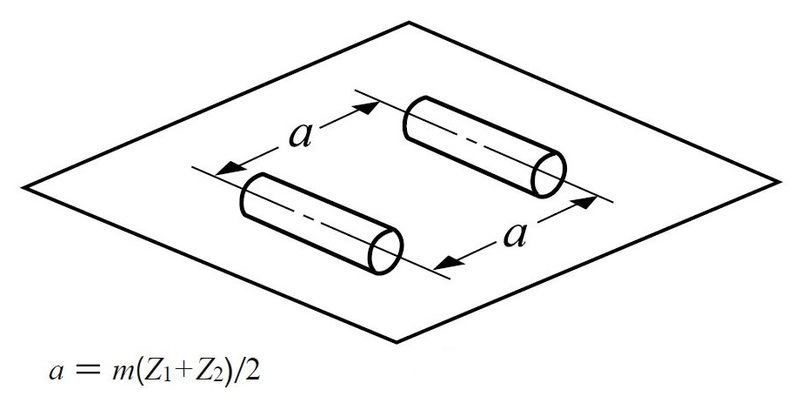 Allowable bending stress and allowable hertz stress are referred to the value shown in the parentheses. SSS Spur Pinion Shafts with module 1.0 or lesser (SA configuration) are set to cantilever support as it is a single shaft type. The maximum bore size is dictated by the requirement that the strength of the hub is to be higher than that of the gear teeth. The maximum bore size should be 60% to 70% of the hub diameter (or teeth root diameter), and 50% to 60% for keyway applied modifications. In order to avoid stress concentration, leave radii on the keyway corners. If you apply induction hardening on gear teeth, please be aware of potential thermal stress cracks. Also, note that the precision grade of the product declines by 1 or 2 grades, as deformation on material may occur. If you require tolerance for bore or other parts, machining is necessary after heat treatment. The hardening method and the state of hardened teeth area are varied depending on the size of gears. Since different hardening treatment is applied in accordance with the module and number of teeth, the hardness level you designate is referred to as the hardness of the reference diameter. For some of our products, there may be a case that the hardness at tooth tip / root may not be equal to the hardness you designated. KHK stock spur gears are designed to give the proper backlash when assembled using the center distance given by the formula below (center distance tolerance of H7 ‒ H8). Backlash may be adjusted by changing the center distance of mating gears. For more information, please consult the technical section on gear backlash (page 56) in separate technical reference book. 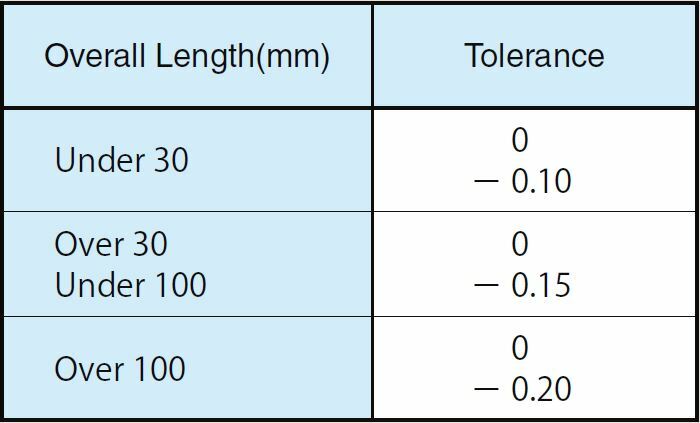 The table below indicates the tolerance on the total length of KHK stock spur gears. Please refer to this data when designing gear boxes or other components. Following products are excluded from this table: Spur pinion shafts, Injection molded spur gears, Fairloc hub spur gears, and MC nylon products. Spur gears produce no thrust forces, however, be sure to fasten them firmly with stepped shafts, or collars, to prevent shifting toward the shaft. 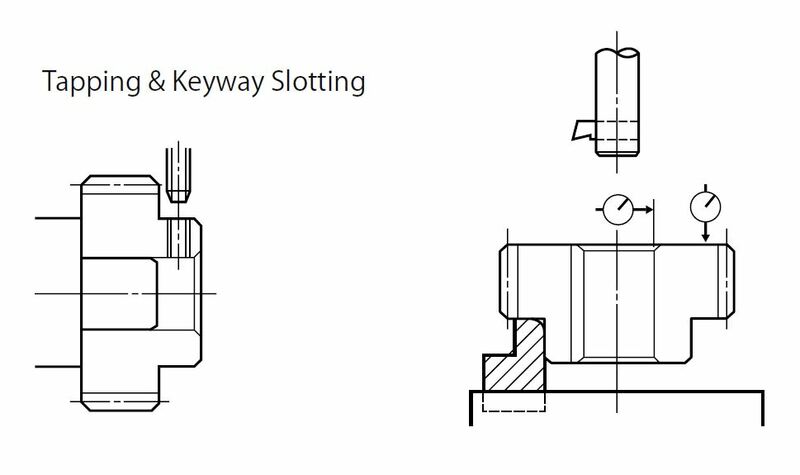 Keyways are generally used in fastening gears to a shaft, and they should be secured by applying drilled holes for set screws, or applying flats to the shaft, in case of fastening only with set screws. There are also methods of secure settings using a MACHALOCK, a Posi-Lock, or a Shupanring, which are parts for the engaging the hole and the axis. Test example: Abrasion occurred on SSG3-30 due to poor edge contact (only 30% with proper contact). The design conditions were load torque at 278 rpm, 42.5 kg/m (12 kW), 1.5 times the allowable bending strength, and 3 times the allowable surface durability torque. The pitting occurred on the poor tooth contact area after 60 hours of continuous operation. 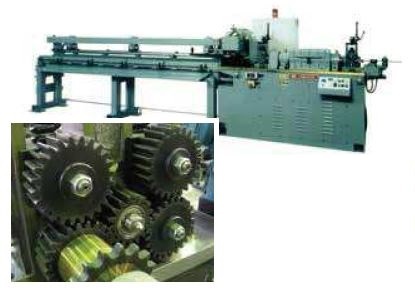 Full-automatic Forming Machine by Jey Machine Co.
SSA and SS Spur Gears are used for stirring devices. 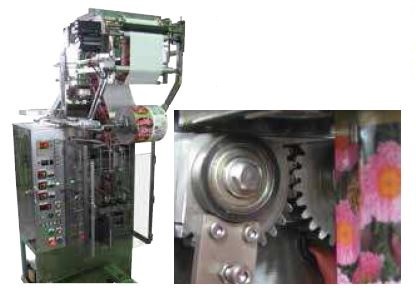 Takashima High-Speed Wire Straightening & Cutting Machines by Takashima Sangyo Co., Ltd.
SS Spur Gears are used at the feeder. SS Spur Gears, segment shaped by secondary operation, are used at the crimping device. Electric Wire Winder by Sakuma Tekko KK. SS Spur Gears are used at the stopper of handgrip.